Tooth decay and other damage can occur when the enamel has become weak. You can have healthier teeth when you take steps to strengthen tooth enamel. Your diet affects your teeth. Emphasize a nutritious, balanced diet, but make sure to include plenty of calcium and protein. Dairy products, leafy green vegetables, meat, fish, eggs, and poultry are some examples. The magnesium in cereal and leafy green vegetables also builds strong tooth enamel. Limit the acidic foods in your diet, such as citrus fruits. Do You Know What To Drink? Dairy milk and soy milk are calcium-rich beverages. The fluoride in tea leaves makes tea another healthy drink. For the most benefits, do not add sugar to your tea. Limit acidic beverages, and do not drink soda. When you shop for toothpaste, read the labels. Choose enamel-hardening toothpaste that contains fluoride. Brush with this toothpaste twice each day. When you drink fluoridated water, it immediately benefits the tooth surfaces. After fluoride is absorbed in your body, your saliva will contain the mineral. The fluoride will keep your tooth enamel strong and healthy. Chewing gum helps your mouth produce saliva. The minerals in saliva strengthen and remineralize tooth enamel. Whenever you want a treat between meals, have sugar-free gum instead of other snacks. Encourage your kids to develop this habit, too. Strong tooth enamel can reduce your risk of cavities, decayed teeth, and other oral health problems. Even if your teeth are no longer in perfect condition, it is not too late to make changes. If you are not sure how to put these changes into action or have more questions about your dental health, make an appointment us today. You can have a checkup and all the information you need to make healthy choices. 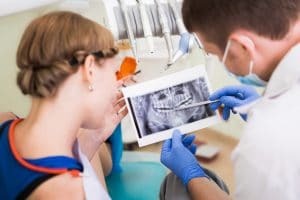 Tooth-Friendly Foods for ThanksgivingWhy Is It Important to Receive Annual Dental X-Rays?